In January 2012, the Federal Communications Commission (FCC) adopted rules that require captioned programs shown on TV in the United States to also include captions if they are delivered over the Internet. The latest guidelines--with a compliance deadline of January 1, 2014--also require that IP video captioning be of at least the same quality as TV captions and have the same tools for users to configure the caption appearance. We helped our Video Cloud customers to meet the FCC's January deadline by integrating a new "Closed Captioning Settings" dialog box within the default Brightcove Video Cloud Smart Player templates--allowing end-viewers to easily configure caption appearance on both desktop and mobile players. 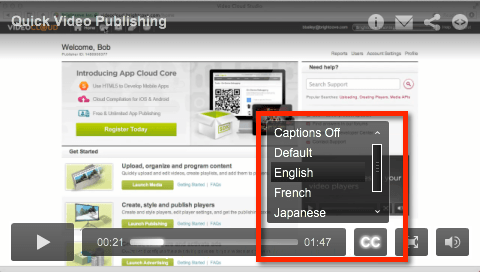 Captioning settings are available out-of-the-box and our customers do not need to take any action in order to include this functionality in their existing player embeds; it will automatically be available. In addition, we are making captioning settings available via API so that publishers can create a customized experience if they choose. To learn more, Brightcove customers can contact their account manager or review this documentation.